Offically licensed New York Jets Dog Jersey – White Trim. This jersey has screen printed team logo, numbers, contrast stitching and woven jock tag. The dog jerseys are made and designed especially for pets. Not only will your dog think its comfortable, you will think its adorable on your furry friend. Pull out the snacks, treats, and balls because its going to be a great game. 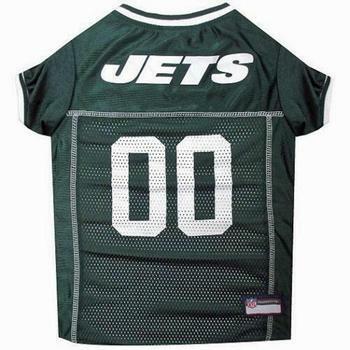 Football jersey for dogs and cats features the officially licensed team name, logo, colors, and NFL shield. Made from 100% polyester jersey for an authentic look that offers maximum comfort and durability. Machine washable so your team’s #1 fan is always looking his best; The perfect gift for sports-loving pet parents!